Hello friends! As one can expect, the shocking lack of blog posts on PTR as of late (read: like the last year) means that I have a whole bunch of mani pics saved up. 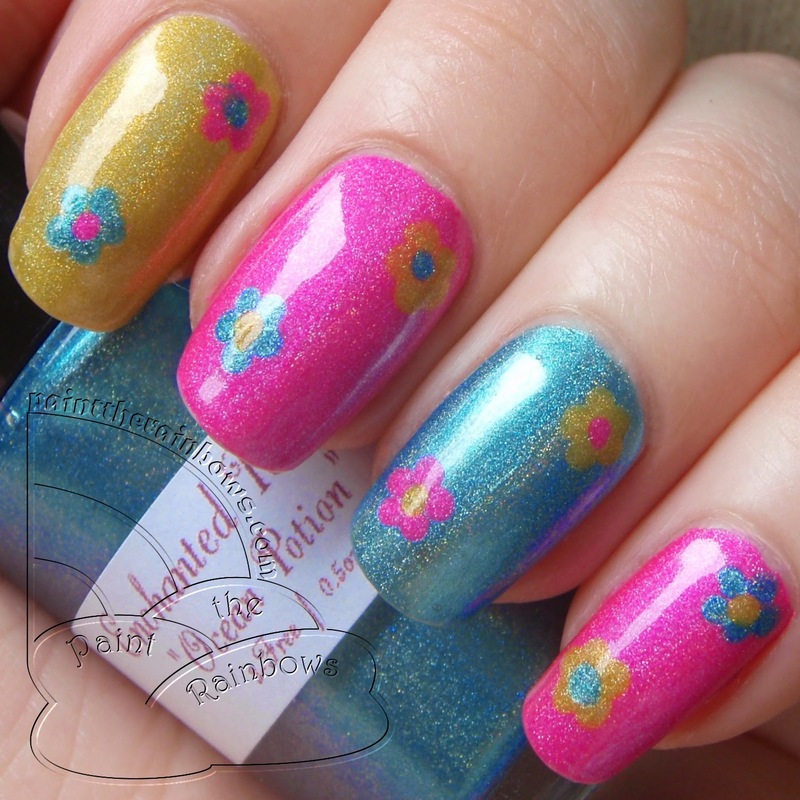 Today, I want to share some of the Enchanted Polish ones! Next up is a Saran wrap marble mani! I first did two coats of Love the Way You Lilac, topcoated it, 1 coat of I'm Kind of a Big Deal, then dabbed balled up Saran wrap on the nail to create a marbled effect. Make sure to topcoat again afterwards, as this method does create some texture -- I love it though! These colors go perfectly together, and such an easy way to do such cool-looking nail art -- should definitely do it more often. Next up is what I like to think of affectionately, to this day (I did this mani last August...) as my Lisa Frank mani! I started out with a skittles base using Yellow Submarine, a bright yellow holo, Disco Barbie, a hot pink holo, and Ocean Potion, an aqua/teal holo. I then used my dotting tool to draw on flowers in alternating colors. Loved this, so bright and cheerful! Lastly, I have Shrimp Cocktail, a bright pinky coral with gold and pink shimmer. I believe I used two coats here. Fantastic application and a gorgeous, super summery color! 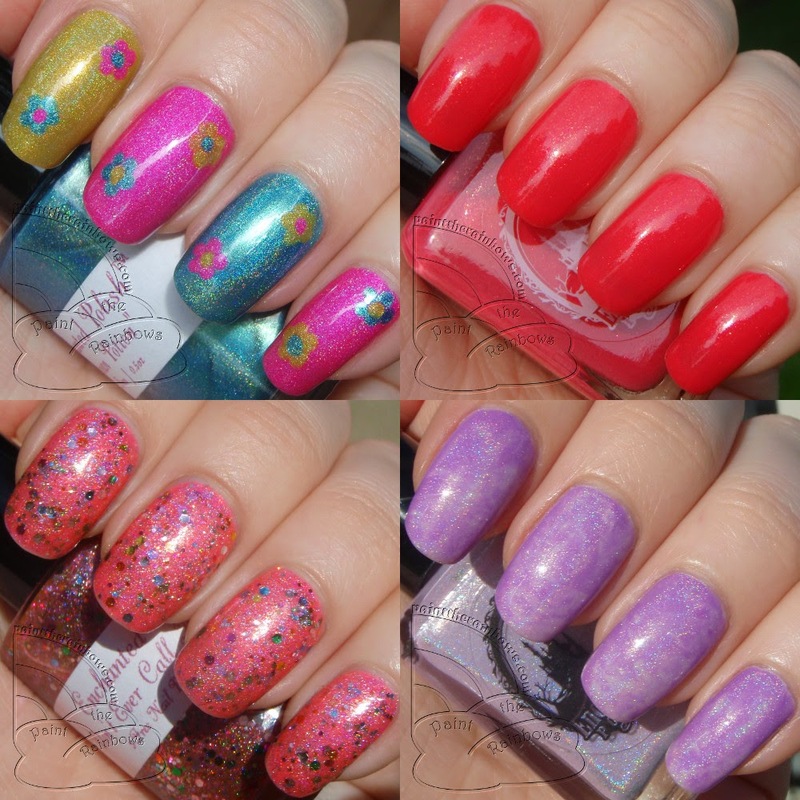 Such lovely manis/polishes! I remember almost posting all of these a long time ago, but for some reason I just never got around to it... until now. Oh well, better late than never!